You are here: Home / Tankless Water Heater Reviews / Rinnai V65EP Review: Why Should You Buy This Tankless Water Heater? Rinnai V65EP Review: Why Should You Buy This Tankless Water Heater? This Innovative technology provides an endless supply of hot water instantaneously. Those days are now gone when we would prioritize activities and schedule hot water use. 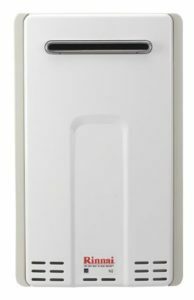 Rinnai V65EP is an energy saver propane tankless water heater that can deliver up to 6.6 gallons per minute. It’s controlled water temperature regardless of the temperature outside (even with 10 degrees’ weather). It is a great source of reliable and clean water. It’s also easy to install in the bathroom or kitchen because of its size. Applications for Rinnai V65EP include; remote bathrooms or hot tubs, solar water heating purposes and appliances such as dishwashers or cloth washers. This is an Energy star qualified tankless water heater and statistics show that a typical family can save up to $100 per year. It will be a perfect investment that lowers the utility cost of your bills. 1. Gas Valve and Blower: This feature enables the user to automatically adjust incoming gas to meet water heating demands. I.E. the Rinnai tankless uses smaller gas when the heating demand is less, and automatically adjusting in cases of greater demand. A digital controller enables the user to choose the desired temperature by turning on the heater and adjusting the temperature inside the house. 2. Temperature Lock: This prevents unauthorized changes in the water temperature, therefore you can worry less about your children accidentally using extremely hot water. This is one of the safety features of Rinnai V65EP; the temperature range for this product is from 98-140 degree Fahrenheit. 3. Improved Scale Detection: Hard water is easily detected therefore reducing calcification inside the machine, reduces the chances of damage, prevents mineral corrosion, thus enabling the burner to work longer and better. Therefore it’s needless to say, the general efficiency of the product is improving. 4. Leak Detection: This feature detects the leaks and automatically shuts off to minimize the damage. This leak detection feature makes Rinnai V65EP stand out among other tankless water heater products. It has a bath fill function that allows you to select how many gallons of water you need in your bathtub. Rinnai V65EP has an energy factor of 0.82 for natural gas, that’s why it’s environmentally friendly and also saves energy, and this product is highly efficient, saves space and more importantly is able to handle up to 6.6gallons per minute of hot water. It has an easy to install manual as a way of enhancing people’s know-how on the usage of the product making it easier to put up the machine and enjoy the comfort of a reliable supply of hot water. This product has a troubleshooting feature, an error code automatically pops up on the digital remote that comes with the system and the actual heating unit, the code helps to narrow down to what exactly should be fixed and the cause of the problem. Including this feature can solve the common problems like water pressure, the presence of hard water, when the water temperature is too high for the unit, cooling problems, and ignition failure. With this innovative design and water heating option the product offers a 12-year warranty and 5-year warranty on each part. This saves you on repair cost for a long period of time. The parts of Rinnai V65EP is replaceable so that the whole system save your cost. It’s designed in a great way that’s why the parts assembled in the product can be removed independently. The only disadvantage associated with the product is the initial price, but come to think of it, the efficiency and reliability that comes with this product offset all costs associated with repair and maintenance. With Rinnai V65EP you get what you pay for. Conventional water heaters are not as half as efficient as the latest technology has to offer. Rinnai V65EP is just one of the major innovations that we have in this generation, with all the good packages that accompany this product, in my opinion, it’s worth the expense. The tank storage saves the energy loss of this tankless water heater. This machine is a must-have for every household since it gets hot faster and with better reliability in comparison to its counterparts like Bosch. Rinnai V65EP recognizes the importance given in the manufacturing and engineering of this product and also equal measures in offering product support both before and after its installation. Rinnai V65EP tankless water heater highly recommended due to the high savings that it will provide in the end. Hope Rinnai V65EP review makes your view clear.